On 16 December 1944, the German Wehrmacht launched what would be its last major offensive in the West. After a powerful bombardment from 2,000 guns and Nebelrwerfer rocket launchers, three German armies with 250,000 soldiers and 1,000 tanks and assault guns advanced against the thinly held American lines in the Ardennes, a hilly and heavily wooded region of eastern Belgium. The American divisions assigned to the “quiet” Ardennes sector were either experienced (99th and 106th Infantry Divisions) or had been bloodied in the battle for the Hürtgen Forest. 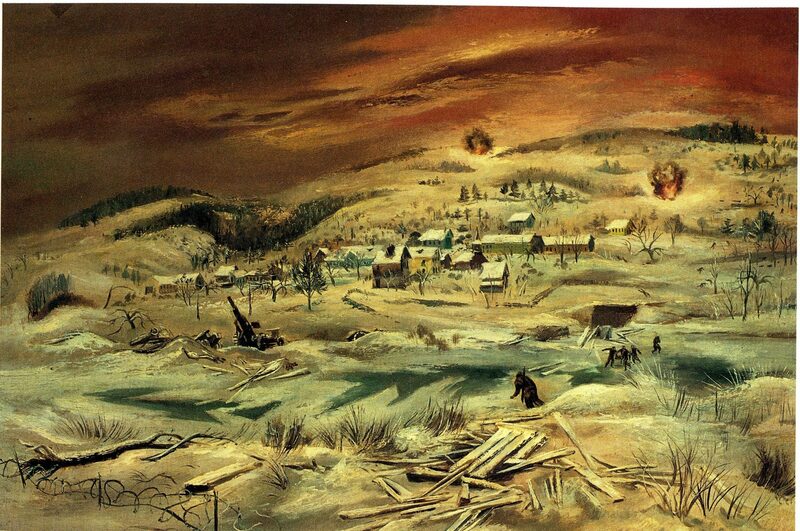 Initially, the Germans experienced some early successes in what became known as the Battle of the Bulge. They surrounded two infantry regiments of the 106th Division and forced them to surrender. 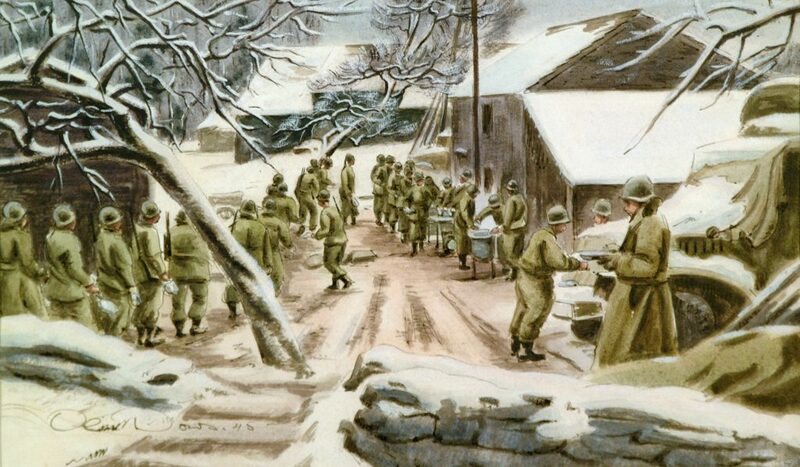 In other locations, the Germans overwhelmed American forces and took thousands of prisoners. However, determined resistance by small groups of soldiers, including combat engineers and various support troops fighting as infantrymen, slowed or even halted the German advance, greatly disrupting the enemy’s timetable for Operation WACHT AM RHEIN (WATCH ON THE RHINE). 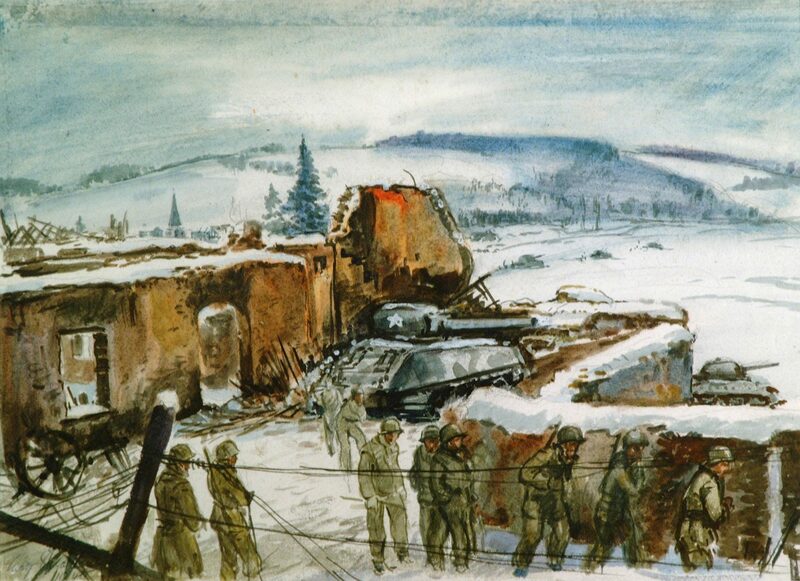 The most desperate fighting occurred at the important Belgian crossroads town of Bastogne. 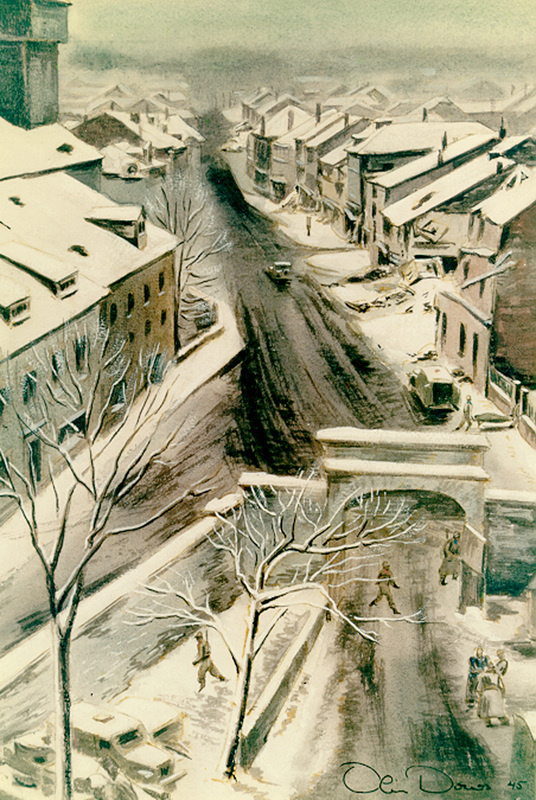 Despite being surrounded and with little food, ammunition, or medical supplies, soldiers of the 101st Airborne Division and various armored, artillery, and other units held out against the Germans until Lieutenant General George S. Patton’s Third Army, led by the 4th Armored Division, broke through the German encirclement on 26 December. The Germans launched a second offensive, Operation NORDWIND (NORTHWIND) on 31 December to the south in Alsace against the U.S. Seventh Army. Like their offensive in the Ardennes, the Germans, aided by bad weather that grounded Allied air power, experienced some initial successes but were eventually driven back. By 25 January 1945, Allied forces had pushed the Germans back to their original lines and all but crippled the Wehrmacht in the West. The cost was high however—100,000 casualties, including 19,000 dead.